BBB TV 12 has learned this morning that Chief Kenny Humphrey of the Harriman Police Department has taken a leave of absence. Byron Tapp will be the interim chief in his absence. Mayor Wayne Best said that the leave of absence was for personal matters. 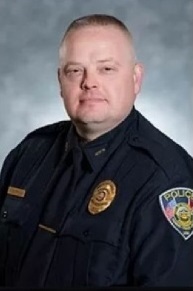 Back in June, Humphrey ran into some trouble when Oak Ridge officers say the Harriman police chief drunkenly called two men gang members at a bar and assaulted one of them in the parking lot. According to police records, 43-year-old Kenneth Humphrey — who currently serves as chief of police at the Harriman Police Department — was at Swifty’s Bar and Grill, 119 S. Illinois Ave., when officers responded around 11 p.m. June 30. The two men, Joshua Bridges and Chance Mullins, told officers that Humphrey was “highly intoxicated” and began berating them for being gang members because they were wearing “biker” clothing. The bar’s owner, Matt Swifty, did not see the assault but did tell officers Humphrey was intoxicated and that he personally escorted Humphrey out of the bar. In the parking lot, Bridges claimed the chief tried to fight him, but he refused. That’s when Humphrey allegedly grabbed Bridges by the neck, and the officer noted red skin and fresh bruising on the victim’s left collar bone and neck that were consistent with that type of assault. Bridges said he knew who Humphrey was because he flashed his badge and identification inside the bar, saying he was the chief of police at HPD. According to Harriman City Manager Kevin Helms, Humphrey self-reported the incident and has kept Helms apprised of the situation. Once he was about to review the details of the case, he put Humphrey on desk duty until further notice and ordered a psychological evaluation meeting for him since his conduct was called into question. “Once the matter is resolved by the court system, I will make a final determination as to any additional action that may be appropriate based upon the court’s findings and the city’s employment policies,” Helm said. BBB TV12 will report more information when it becomes available.